We caught up with TopRank® Marketing chief executive and co-founder Lee Odden to ask him several questions ahead of his keynote address at the Pubcon Florida 2018 conference, which will take place on Thursday, April 12, 2018 at 9:00 a.m. Eastern Time at the Fort Lauderdale Convention Center in sunny Fort Lauderdale, Florida. 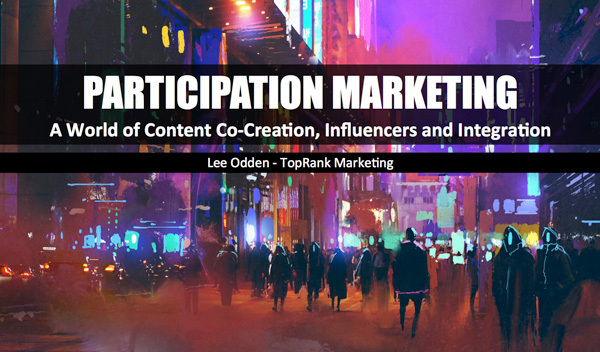 Lee will share the latest trends and research in participation marketing during his Pubcon Florida 2018 keynote, “Participation Marketing: A World of Content Co-Creation, Influencers, and Integration,” a presentation he’s especially looking forward to delivering at one of the industry’s oldest and most respected conferences. Q: What does Pubcon mean to you, and what are some of the memories that have stuck with you over the years about the event? Lee: At my very first Pubcon sitting on my own in the lunch area, I noticed a few “famous” SEOs talking with each other. As an introvert (at the time) it took a lot for me to approach and say hi. Eric Ward looked up and invited me to join the conversation. I couldn’t believe it. These people I had looked up to for years were not only smart and insanely talented, but welcoming and friendly. That openness was something I experienced many times over the years at Pubcon conferences. The sense of community is incredibly strong, whether people know each other or not, whether they are competitors or not. The openness of the Pubcon community opened many doors for me: knowledge, friends/professional connections, and opportunities. In fact, one of my very first experiences speaking at a search marketing conference happened because Brett Tabke gave me an opportunity as an unknown. I will always appreciate that and where my career evolved as a result. Q: When delivering a keynote presentation, how do you strike a balance between speaking in too general a scope and being overly technical, especially with the type of tech-savvy audience that often frequents Pubcon? Lee: My role as CEO calls for me to think strategically most of the time. However, my roots in marketing started with SEO and I’ve kept my practitioner skills fairly sharp by continuously experimenting with our own marketing. My keynote presentations reflect this duality and I do my best to empathize with the audience and the intersection between what they might want to know and the expertise I can bring. I like to start with stories, which everyone can relate to and then talk about trends and models to explain the why of the examples and tactics used to illustrate the models in action. I think it’s because of this strategic and tactical combination of storytelling that Pubcon asked me to reprise my keynote from the Las Vegas show to the Fort Lauderdale show. Q: Can you give us a glimpse into some of the participation marketing insights you’re particularly excited about sharing during Pubcon Flordia 2018? Lee: Just about every marketer has had the experience of being expected to create more content with the same or fewer resources. They are expected to do this while customers increasingly don’t trust brand content. Trends like information overload, distrust of advertising, and greater sophistication of consumers use of technology are impacting marketing programs all over the world. The bar has been raised for marketing and consumer expectations are having a more powerful impact than ever. To address these trends and give marketers insights that will fast track their ability to adapt, I’ll be talking about six of the top marketing challenges — in zombie form, of course — what the convergence of marketing and PR means to us now and in the future, and a shift from the “me” focused marketing that is so prevalent to a “we” approach that is collaborative, scaleable and far more impactful. The approach I’ll suggest is called “Participation Marketing” a combination of content marketing, user generated content, employee advocacy and influencer marketing that brings a democratized approach to developing content that customers will actually want to consume, because they or their peers probably had a hand in creating it. Thanks to Lee for sharing some of his excellent Pubcon memories, and we hope you’ll join him along with the many other top speakers at the Fort Lauderdale Convention Center at Pubcon Florida 2018 to catch his keynote and learn the latest tested and proven models, strategies, and tactics for content marketing. 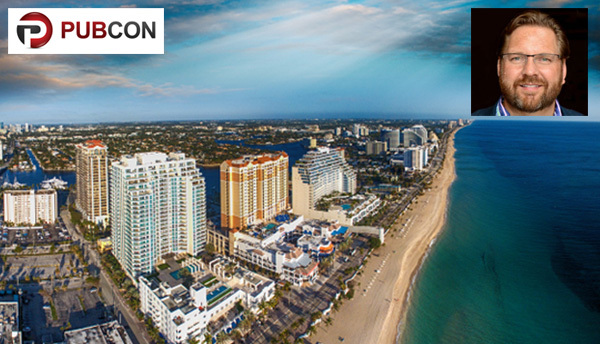 Registration and conference details are available on the Pubcon Florida 2018 website.